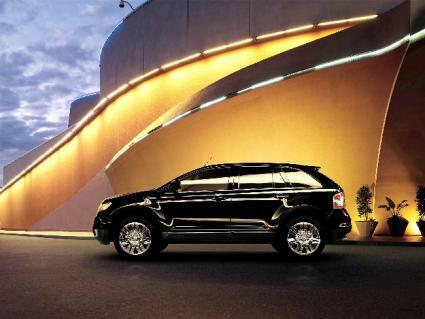 The Ford Edge concept vehicle became a reality with its release in 2007. Already a favorite mid-size crossover SUV, it comes in seven models with prices ranging from $26,920 to $35,770. The Edge first appeared at the North American Auto Show in January of 2006. The 2007 Edge models hit dealer showroom floors in December of 2006 as a 2007 model. First models included the SE, SEL and the SEL Plus. Although the Edge was well received, it lacked many of the interior options consumers wanted. By 2009, the Ford Edge had seven different models, the SE, SEL in both front-wheel drive and all-wheel drive, the Limited, again in front-wheel and all-wheel drive, and the Sport also available in both front-wheel and all-wheel drive. The Edge offered nine different exterior colors, silver, white, blue, red candy, white suede, sterling grey, cinnamon, dark ink blue and the sport blue metallic available only on the Sport model. All models come with an automatic transmission, and a 3.6 liter, six cylinder, 265-horsepower engine. 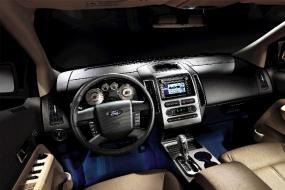 By 2010, Ford Motor Company engineers completed interior options consumers desired, including an ambient lighting package, front passenger grab handles, SYNC with 911 assist with no monthly fees, twenty inch wheels and the Vista Roof continued to be a favorite option. The Vista roof offers panoramic views from its large glass moon roof. The Ford Edge had an improved fuel economy of two miles per gallon in 2010; the front-wheel drive models achieving 18 miles per gallon in the city and 25 miles per gallon on the highway. All-wheel drive models achieved 17 miles per gallon on city streets and 23 miles per gallon on highways. Safety in the Edge by 2010 included four-wheel anti-lock brakes, adjustable head restraints, Advanced Trac with roll stability control, seat belt reminder, child safety locks, adjustable safety belts, and a tire pressure monitoring system. All of these safety features plus the canopy side curtain air bags along with driver and passenger air bags helped garnish the Ford Edge a Five-Star safety rating from the National Highway Traffic Safety Administration (NHTSA). Drivers these days want interior options that meet their needs. The Ford Edge does not disappoint in the area with options like the Audio/MP3 input jack, a one-touch integrated start, AM/FM stereo clock, and a six-CD player along with four speakers. It also comes with Sirius satellite radio and the Ford SYNC hands-free communications and entertainment system along with a voice-activated navigation system and universal garage door opener. Leather interior seats were upgraded to include contrasting stitching and deluxe floor mats with the Edge logo. If that weren't enough, Ford offered both heated and cooling seats along with entertainment screens on the back of each front headrest. The Ford Edge seats five and offers six-way power adjusted front seats and adult size headroom in the second row with its 60/40 split bench that folds, offering up a 32.2 cubic feet of cargo area. This midsize crossover SUV now falls into the category of the crossover vehicle or CUV as the demand for the cargo and comfort of a minivan but the style of a crossover are combined. Ford Canada has promised a Ford Edge hydrogen-electric plug-in hybrid to debut in 2010, which pairs an electric motor with a V6 gas engine. Another Ford Edge concept is the HySeries that utilizes a hydrogen fuel cell and a lithium-ion battery pack that can run for approximately 200 miles on one charge. The HySeries was featured in the James Bond film, Quantum of Solace starring Daniel Craig in 2008 and as concept vehicles go, Ford may just release this plug-in model. Some manufacturers produce and reveal concept models that never hit the showroom floor, however, with the need for less emissions and alternative fuel options in the vehicles we drive, expect more hybrids to hit the road from Ford as well as other auto manufacturers. With style, a comfortable ride, and a sister vehicle, the luxury Lincoln MKS, the Ford Edge has made quite an impression on both auto experts at Edmunds, and consumers nationwide. The Ford Edge concept has turned into a reality of popularity for Ford Motor Company and fans await future model years with sporty features, interior must-haves, and a driving experience that is full of performance.